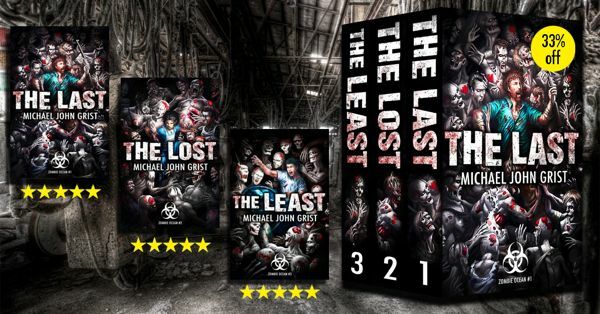 For the past week I’ve been experimenting with Facebook advertising to push my box set, books 1-3 of the Zombie Ocean: The Last, The Lost, The Least. It’s not my first time to run facebook ads, but my first time to make some effort. On previous occasions I didn’t design the ad image or pay much attention to the ad copy. It failed. Would you survive the zombie apocalypse? If you were alone? Love The Walking Dead? Miss it now season 6 is over? Follow Amo, an everyday, normal guy through three best-selling books of blood, guts and unbelievable twists, as he fights 300 million of the undead, alone. 3 full books with over 100 5-star reviews on Amazon, at 33% off! Click to learn more. This has a hook, has social proof (number of reviews), has deal offer (33% off), plus a CTA (Call To Action- Click to learn more). Everything my reading of digital marketing suggests a good ad should have. With Facebook ads you can target really specific interests and demographics- so I started off wide with all ages 18-65, both genders, in the US, interested in World War Z (novel), I Am Legend (novel) and Reading. And I got results- or at least seemed to. It was pretty amazing. I didn’t have any way to know for sure if buys and page-reads were coming from the ads or independently, but it looked like I was getting a 15% return on ad spend, at $5.99 per box set. That is amazing. Who was clicking on my Facebook ads? Curiously, men and women in equal measure, but mostly 18-24, some 19-45. I fine-tuned. I improved ad copy slightly. I targeted more specifically- to amazon kindle readers in particular, but the same zombie novels, and also the audience of the Walking Dead. And, sales fell off. They weren’t big anyway- I only had a budget of 10 pounds a day- but I started to make losses. Now I’ve set up much better tracking so I can see if any sales are due directly to the ads or some other reason, but there is nothing happening to track. So I’ve turned all the ads off except for the original which seemed to be doing well, as I can’t afford to throw away 10 pounds every day for no result. We shall see. It’s a dream really- that I can put 10 pounds in and get 11.50 back. I wish it’d work, and I know for some indie authors (much bigger with more reviews than me) it does, but maybe it is a dream. Experimentation is the only way to know. What do you think of the ad? Would it entice you? instead of focusing on the book titles, which are a bit confusing to the casual glancee..
“Zombies” means something to the target market, but “The Last” only means something to your readers. Yeah you have a good point here, thanks Rob. My book titles are optimized really for visual branding- but not so well-branded for SEO. I’m thinking to do rework the cover slightly so ‘Zombie Ocean #’ plays bigger, and then in the Amazon book title adopt a format like- ‘Zombie Ocean 1: The Last’ for clarity, and to boost the Zombieness, and use Zombie Ocean as the prime keyword. I looked recently into changing that, and using something keyword-rich like ‘Zombie Apocalypse’ as the series title, but that is also really generic. So, I’ll stick with the Ocean. UPDATE -all ads turned off for now.